Previously, AzhwAr invited prayOjanAntharaparar (those who are having ulterior goals), i.e., both kaivalyArththi (in 4th pAsuram) and aiswaryArththi (in 5th pAsuram), after inviting ananyaprOjanar (ones who are focussed on kainkaryam only in 3rd pAsuram) – this is because AzhwAr sees bhagavAn‘s magnanimity in accepting all as mentioned in srI bhagavatha gIthA 6.18 “udhArAs sarva EvaithE” (All of them (who approach me) are generous) and considering his relationship with all entities. Now, those who are invited by AzhwAr to perform mangaLAsAsanam (praising for the well-being) to emperumAn start arriving. First, ananyaprayOjanar (those who are fully focussed on kaikaryam) arrive highlighting their family heritage. Is it correct to indulge in self-praise? They are doing it to eliminate the fear from AzhwAr’s heart, just like thiruvadi (hanumAn) highlighted his greatness to remove the fear from the hearts of the assembled monkey army – so there is nothing wrong in that. tham mUththappan – “appan” means father of the third generation person, and “mUththappan” indicates his father. Thus, 7 generations are highlighted. AzhwAr invited them saying “EzhAtkAlam pazhippilOm“, and they arrive saying “EzhpadikAl thodangi“. What is the purpose of highlighting individual generations? They do that to show their affection towards those who performed mangaLAsAsanam to emperumAn. As explained in Apasthamba sUthram 1.1.6 “sa hi vidhyAthastham janayathi thachchrEshtam janma” (The preceptor makes the disciple become born-again through knowledge; this birth is the best) and manu smruthi 2.146 “karIyAn brahmatha: pithA” (knowledge giving father is greater than body giving father), knowledge-based relationship is greatly glorified; but is it OK to glorify just body-based relationships which are explained to be given up in vihagEswara samhitha 22 “pitharam mAtharam dhArAn” (Mother, Father, wives, etc., are to be given up)? They can be glorified – if they are connected to bhagavAn. Even if one is greatly knowledgable, if he does not accept bhagavAn, he is to be given up – so the underlying factor is bhagavath sambandham (being related to bhagavAn). EzhpadikAl thodangi – Though the seven generations are explained individually, here collectively the family heritage is thought about due to the attachment for the same. vazhi vazhi AL cheyginROm – We serve(d) in proper ways without any faults, i.e., without interruption (in generations) for performing mangaLAsAsanam. Just like a family which did not undergo vEdha adhyayanam for 3 generations, the ones who are born in such family are not qualified to be brAhmaNa and cannot engage in any vaidhIka karma, when a family does not perform mangaLAsAsanam for 3 generations, those who are born in such families cannot be qualified as vaishNava. Such defect is not present in our family. “vazhi vazhi” (repetition) indicates the path of sAsthram and sistAchAram (practice of AchAryas) as well. AL cheyginROm – Serving, means singing “thiruppallANdu” (performing mangaLAsAsanam). Until now, they explained the glories of their family. Further, they speak about their activities. thiruvONath thiruvizhavil – AzhwAr saying “sravaNam” as the day of appearance (which is the general birth-star for srIman nArAyaNan) instead of the specific time – this is because, AzhwAr fears if the enemies know emperumAn‘s exact birth date/time, they may try to harm him. anthiyam pOthil – When the dhEvas are weakened and the asuras are stronger. 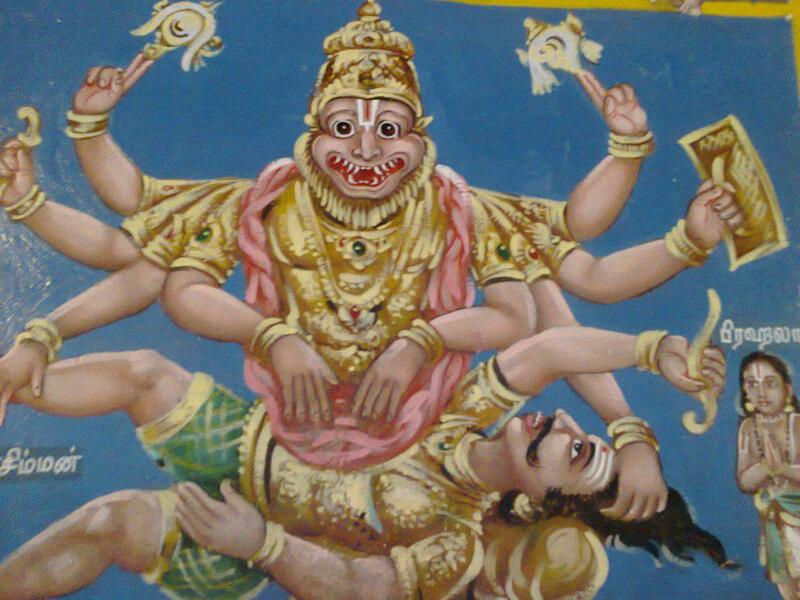 ari uru Agi – In the beautiful form of narasimha which is to be glorified immediately as explained in sahasranAmam “nArasimha vapu:srImAn” (one who is having a human-lion form, which is extremely beautiful), nAnmugan thiruvanthAdhi – 22 “azhagiyAn thAnE ari uruvan thAnE” (he is the beautiful person; he is in the form of a lion), etc. ariyai azhiththavanai – ari – chathru (enemy). He completely destroyed hiraNyakasipu who had enmity towards him from birth. AzhwAr fears highlighting this incident because he thinks if the descendants (or other asuras) come to know about this, they will show enmity towards bhagavAn. panthanai thIra – to cool-off the fatigue of killing such evil hiraNyakasipu; panthanai means certain disease which affects new-born babies – since narasimhan emperumAn killed hiraNyakasipu on the same day of appearance, AzhwAr fears for such disease. pallANdu – AzhwAr thinks that – on hearing the mangaLAsAsanam from devotees (who are favourable), such fatigue will be removed quickly. pallAyiraththANdu enRu pAduthumE – Not feeling satisfied with saying pallANdu just once, they say it should be said/done for eternity. This is identified as the activity of such devotees. This entry was posted in mudhalAyiram, thiruppallANdu on October 29, 2015 by Sarathy Thothathri.